Welcome to Sand and Sea Bungalows. In 2013 Sand and Sea finished their extensive renovations including new very nice luxry bungalows and another large pool. Looking very good at the moment! As well as a large pool overlooking the beach there is another new very impressive pool in the middle of the resort. 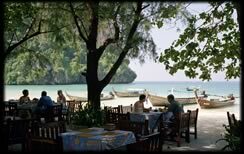 The Restaurant overlooks the Andaman sea. You can enjoy the mornings with a buffet breakfast. 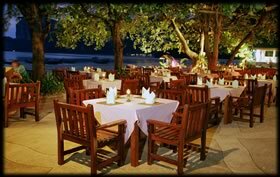 In the evening there is a range of Continental, Chinese and Thai dishes. The fresh seafood is particularly good. High season runs from November 1 to the end of April. Low season is May to the end of October. (Double only) includes Jacuzzi, house phone, bathrobes, slippers, TV, tea and coffee making facilities, AC, a hairdryer and a fruit basket on arrival. The new "Grand Deluxe" rooms were built in 2013 in two story buildings around a new pool. They are big, very nicely furnished and finished, with an extremely comfortable spar type bath, great shower and a bed wider then it is long. 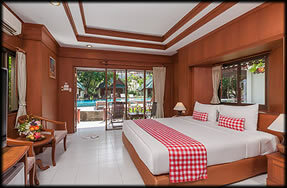 All in all some of the nicest rooms in railay. 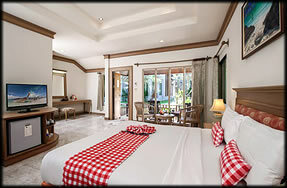 An extra bed in the rooms costs 600 Baht in low season and 900 Baht in Peak and High season. Please request if a baby cot is needed. If we have one available it will be provided free of charge. Children sharing a bed with a parent (i.e. 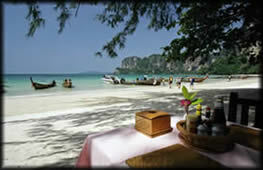 no extra bed) are charged 175 Baht per day for breakfast- No extra charges for children under three. On the 24th December we have a special Christmas gala dinner for all of our guests. 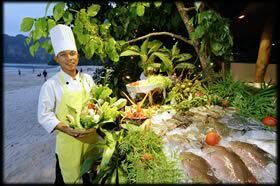 All of our guests will be charged 1,500 Baht per adult and 7,50 Baht per child for this feast. 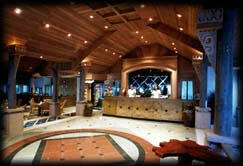 There is a day spa for guests to enjoy a variety of massages and beauty treatments. There is nothing quite like being pampered and looked after and the massages are very good. 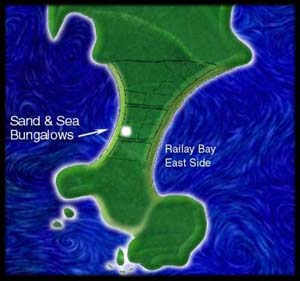 Sand and Sea bungalows are located on the thin strip of land which makes up the Railay peninsula. 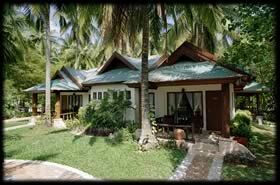 All of the bungalows are no more than a couple of minutes walk from the beach. To book a stay please fill out the booking form below. 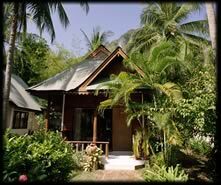 It is a good idea to book several months in advance during high season as we do get very full.